with which program i have to open them? You need ikonpackager for it, Sir Benny. BTW i will update the icons very soon. 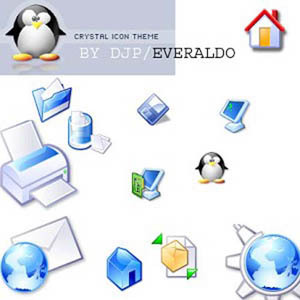 Hey DJP - How can I get a set of the icons with just the penguin? any chance of getting .png files for the icons for use in ObjectDock? i like the icons very much. maybe it is possible to make different color themes (yellow, red or green)??? Would be great! DJP You ever gonna finish converting them all from 128x128? Just wondering. I wont add sizes higher then 48*48 to the package. They are already used in ObjectDock. If you want them in 128x128 for use with object dock(@HaLLuCino), they are already available for object dock and they look great there too. Great icons by the way. Thank You. I was looking for the set for quite a while. want to retrieve original Emoticons from Incredimail???????? I really liked the icons...they look great on my desktop! Thank you!